Autism Services annual Artists of Autism event. The theme was “throwback” and it featured a selection of work by artists with autism in remembrance of things past – Old Hollywood, classic cars, retro phones and plenty of nostalgic television. The band performed throwback classics including Brown Eyed Girl, Lean on Me, and My Girl. 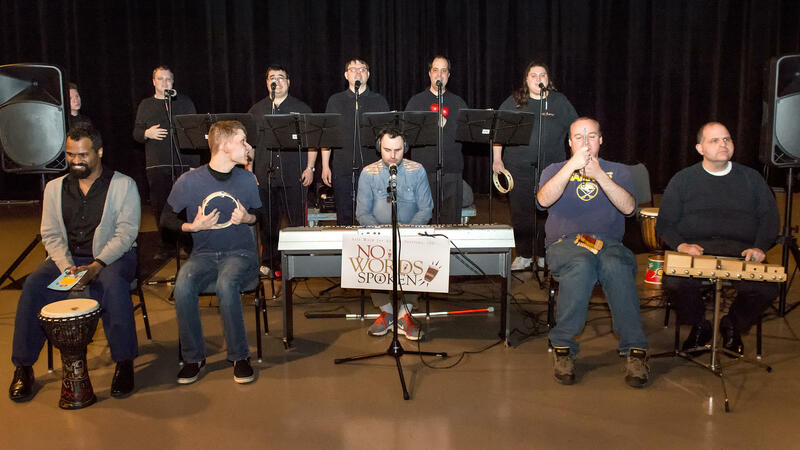 Autism Services students band, "No Words Spoken”, perform at the art opening. 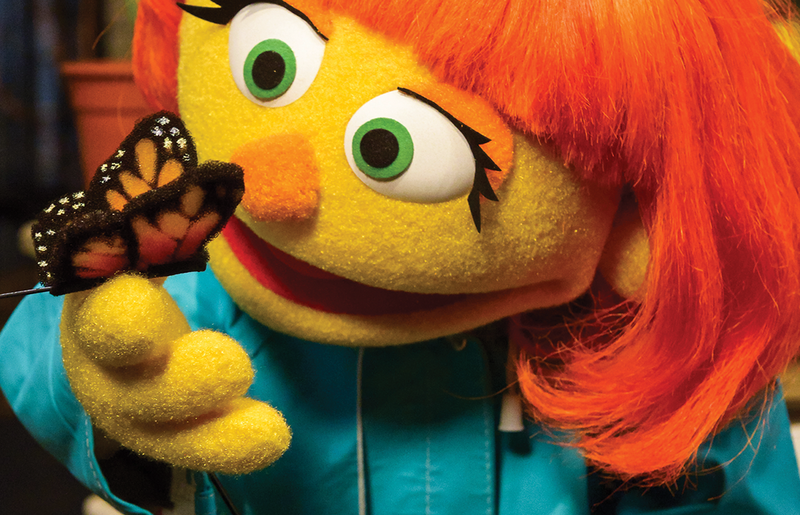 This annual arts event is designed to focus on what people with autism can do instead of what they are unable to do. Veronica Federiconi, CEO of Autism Services, joined students at the opening reception Wednesday. WNED|WBFO Horizon Gallery is home to artwork from artists with autism. “I think people tend to focus on what they are not able to do, or not capable of doing, so in that respect I believe there are [misconceptions about people with autism]. They are no different than you or I. They may process a little differently, or learn in a different way, but actually we are all equals and we really try to respect and celebrate the fact that they’re no different from anybody else. It’s just another population of a very diverse culture,” Federiconi said. One of the artists, Liz Harzewski, was thrilled when she learned that her painting, Nature Cat, had been sold. Liz Harzewski was thrilled when she learned that her artwork, titled Nature Cat, was sold. “How on earth could I ever be so lucky?” declared Harzewski upon learning of the sale of her work. When people with autism repeat the same thing over and over again, people are inclined to redirect the topic, said Federiconi. “But what we do is really encourage them to talk about what’s of interest of them through different ways. So putting those interests on canvas and then exhibiting them really brings it to the community—for the community to be aware of their abilities and to enjoy what they’re capable of doing,” Federiconi explained. 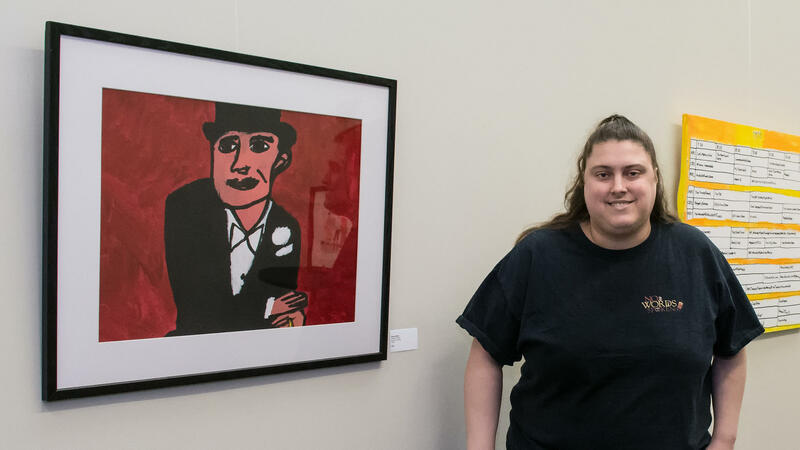 Autism artist Stacey stands next to her work depicting Charlie Chaplin. The band performed throwback classics in keeping with the theme of the exhibit. “The event, we’re doing a throwback show, so a lot of the artwork on the walls is a lot of throwback material from the music that we’re going to be playing. So a lot of the songs are actually older songs that, before I started working here, the guys know from heart,” Gorfien said. 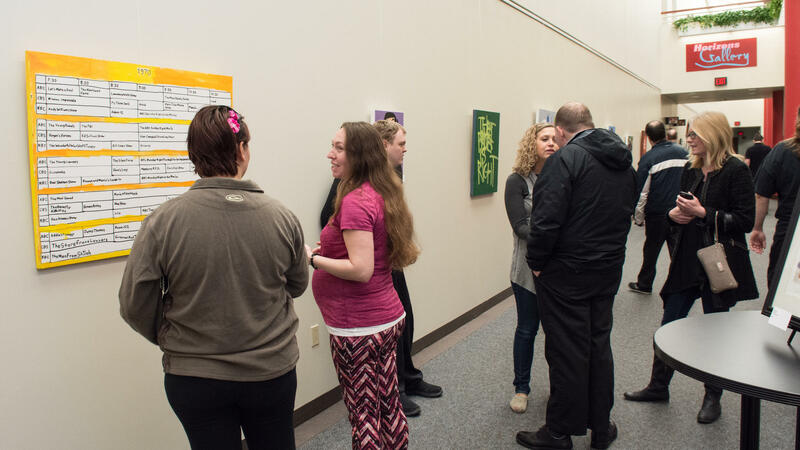 The artwork will remain on display in the gallery and is for sale until April 28. 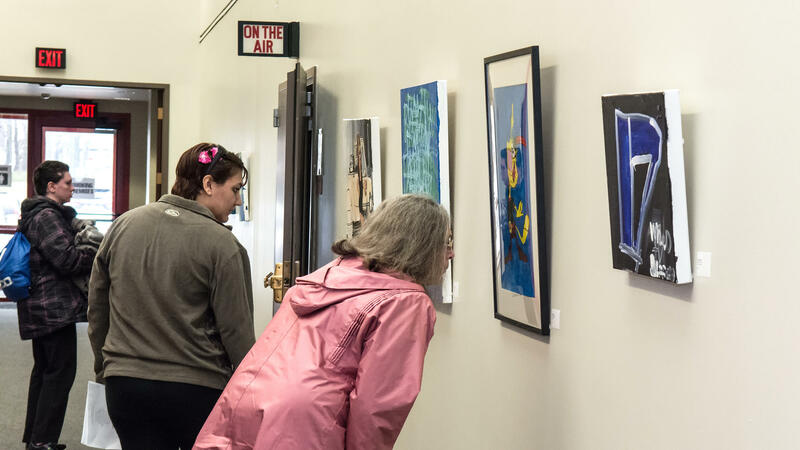 WNED/WBFO Horizon Gallery is home to artwork from Artists of Autism. “Our hope is that people will buy it, but it’s not necessary, it’s more for people to just enjoy it in their environment and learn to have a better respect for the work that people are capable of doing,” Federiconi remarked. Federiconi noted a percent of the art sold will go back to the artist. The remainder of the proceeds will go back into the service provided by the organization. “It’s extremely costly to buy canvases and all the materials that are needed, but certainly worth it. So the money will go right back into the service,” Federiconi said. 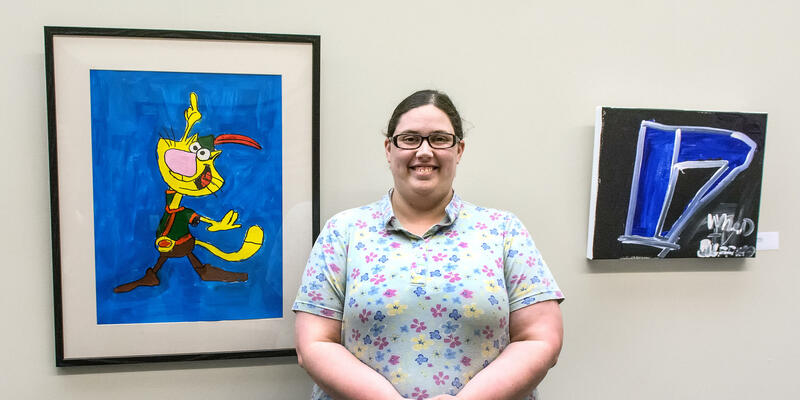 For more than a decade, the organization has been presenting the art exhibit, giving the autistic students a voice to speak through artwork and music. “It’s just another way to highlight what these folks are really capable of doing. They’re amazing artists, musicians, performers. They really enjoy it. They love to get the feedback from the audience,” remarked Fedriconi.